Grand Lake’s favorite holiday – July 4th – is now right around the corner and folks plan all year for the Independence Day holiday time at Grand Lake. Besides spending bazillions of dollars locally to buy fireworks and blow their own stuff up…people can’t wait for the legendary on the water fireworks shows. This year July 4th falls on a Saturday – which likely means a shorter vacation weekend for you – but for those of us at the lake, the days all kind of run together every year around the 4th. And…in case you are wondering…YES…the JETS ARE BACK for the Duck Creek Fireworks! And this year will be no different with at least 2 evenings of sky filled fireworks over Grand Lake. The City of Grove will host their annual July 3rd Celebration & Fireworks on Friday night, July 3rd (really!) at Wolf Creek Park. The fun and entertainment start in the park at 6:00 pm with the fireworks show set to boom a little after 9 pm out on the water of Wolf Creek. Grand Lake Fireworks, Inc., has been host for 7 years now of South Grand Lake’s newest and most accessible fireworks show that takes place on the water, between the spillways in Disney. This year the show happens on Friday night, July 3rd with loud noises and pretty colors starting around 9:30 pm. Visit http://grandlakefireworks.com for more details or to donate to this great community event. Monkey Island Fireworks will return again this year on Friday night, July 3rd. 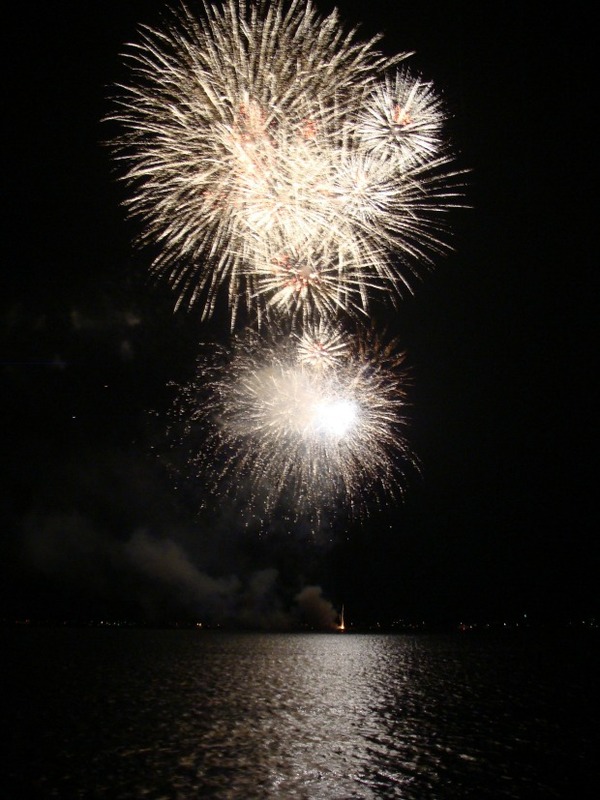 Speaking of loud noises…the Grand Daddy of all Grand Lake Fireworks shows is undoubtedly the Duck Creek Fireworks and this year the can’t miss event happens on Saturday night, July 4th 2015. As usual, you can expect a full evening of awesome fly-overs by the warbirds and others (there are always others, no?) and then the show itself will start at dusk. Visit their website at http://www.duckcreekfireworksok.com/ for details and updates. Those are the biggies…the ‘on the water’ shows. Make plans now to come to Grand Lake for the July 4th holiday. And buy fireworks. And blow them up. And buy more fireworks. And blow them up. And then check out one of the awesome Grand Lake fireworks shows for 2015!